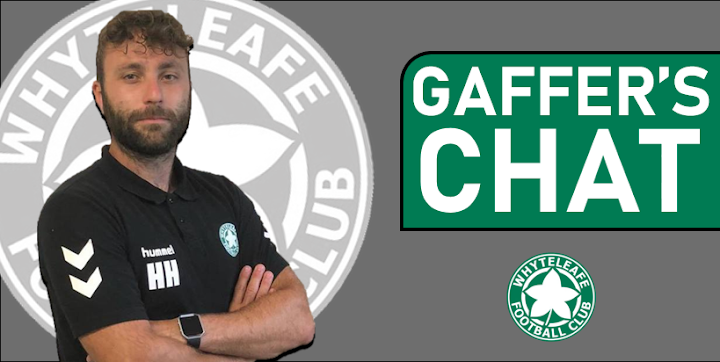 Whyteleafe FC committee member and motoring journalist, Steve Hole, sits down for his weekly chat with Leafe boss, Harry Hudson for a round-up of the latest developments and results. This week Harry talks about talks about last week’s pleasing home draw to Whitstable Town that ended our run of defeats and rejoices in the news that he almost has a full-strength squad to pick from for the first time in three months! He also reveals that midfielder Dan Hector is one of the most talented young players he’s worked with. Now, when you consider that our Harry’s coaching resume features some top-line players such as Jordan Sancho and Josh Maja, that is high praise indeed. Harry also looks forward to this Saturday’s home match against Herne Bay FC (Church Road – 3pm) – See you there. Harry, a promising result at home to Whitstable Town FC last Saturday. We seemed to be playing ‘our’ brand of football again? The only thing missing was the winning goal. Yes, overall I was pleased that we found our identity again. Although we were sloppy at times, and looked nervous early on, I was pleased with the boys. I thought we did enough to win the game - especially when their penalty was never a penalty! I’ve watched it back and it’s a really poor decision...their player is very convincing and fair play for him to get that for his team. We need to improve our decision making in the final third to create more opportunities but it is an improvement and something positive to build on. Now, I know I coined the ‘Harry Knows’ expression earlier in the season having nicked it from Arsenal fans (well they don’t have cause to use it anymore!) and you really did know how important the loss of Nathan Campbell was going to be! All due respect to the other defenders, of course, but it was great to see him back last Saturday. Our match reporter, Brian Davis, called it right. He named him as man of the match. Comments? Cam is an exceptional centre-back at this level, and probably the level above, and we are extremely lucky to have him captain our side. His experience, leadership and understanding is irreplaceable. Cam is so important to us off the pitch as well - is presence in the changing room gives all other players a lift. It is great to have him back. It’s looking like Nathan’s central defensive partner, the equally important, Corey Holder will be back this week? We are hopeful! I have everything crossed to get Corey back alongside Cam. A word on the lads who have been drafted in, often in un-familiar positions during the injury crisis (no other way to describe it really) you recently endured? Absolutely, the boys have been so resilient and adaptable in the past three months - I can only thank them. As you say the players have performed admirably, often out of position, often as teenagers during their first season at this level so a huge hat’s off to them. Goalkeeper Tyler McCarthy is back this week? Tyler is back from his golfing trip. He has been so committed to our cause this whole season and we look forward to getting him back. I am really pleased he enjoyed his time away. A huge thanks to Sheiks Ceesay who deputised fantastically last week. Dan Hector has really impressed after being out for three months, too? He has much more to go as well! We are only seeing Hector at 50 per cent at the moment but when he gets back fit and sharp he will tear it up. On his game, he is such a talented footballer - one of the best I have ever worked with. What are your thoughts on this week’s home match when we entertain Herne Bay FC (Church Road, March 30 – 3pm)? They were the division’s whipping boys early in the season and also lost their star striker, Jake Embery, to National League side Maidstone United recently. They are very up and down with their results but have the potential on any given day to turn over any team at this level. If we can build on last week’s performance then we will have a good chance. Our fans were outstanding last week and I really hope we can deliver the three points this Saturday that they deserve. Thinking positive thoughts. No injuries this week? No additional ones although we are eagerly awaiting news on Corey and Bentley Graham.